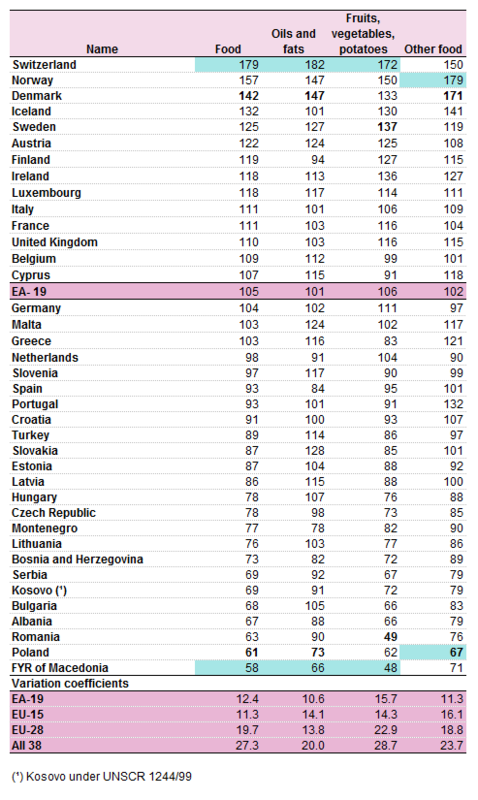 Statistics from Eurostat measuring the price levels of food, beverages and tobacco show that the Nordic countries, Ireland and Luxembourg have the steepest food prices in Europe. Denmark had the highest price level for food and non-alcoholic beverages in the EU in 2015, at 145% of the EU average, followed by Sweden (124%), Austria (120%) and Ireland. On the other side, the lowest price levels were observed in Poland(63%), Romania (64%), Bulgaria (70%) and Lithuania (78%). While Greece isn’t one of the most expensive or cheapest countries of the list, there are several categories where prices in the country surpass the average of the 28 member – states. For instance, the beautiful mediterranean country is the second most expensive in the sector of dairy products (milk and cheese) and eggs. Cyprus is the most expensive country in the same category of foods, while Lithuania and Poland are the countries with the lowest prices in milk and cheese products. Greece is also above average in bread and cereals (+14%), and alcoholic beverages (+17%) while prices in the country are below average in fruit and vegetables (-17%), meat (-12%) and tobacco (-24%). For bread and cereals, price levels ranged from 53% of the EU average in Romania to 162% in Denmark; for meat from 54% in Poland to 137% in Denmark; and for milk, cheese &eggs from 65% in Polandto 140% in Cyprus.The price levels for alcoholic beverages ranged from one to more than twoand a half. The lowest price levels were registered in Bulgaria(64% of the EU average), Romania (72%) and Hungary(74%), and the highest in Ireland (175%), Finland (172%) and the United Kingdom (163%). For tobacco, the price levels were almost four times higher in the most expensive Member State than in the cheapest. The lowest price levels were observed in Bulgaria (50% of the EU average), Croatia and Lithuania (both 56%), and the highest in the United Kingdom (218%), Ireland (189%) and France(127%). All things said, apart from the numbers above, we should also have in mind that there are important differences across Europe, as far as individual income is concerned, or other important factors, affecting European farmers in a differnet way in each country, such as high input costs and difficulties with direct payments. You can read here and here Eurostat’s report on consumer price levels in Europe.